Terre du Baguier - Salsa. This holiday home is located in a private domain with 3 other houses, it is very quiet and rural. It is close to the sea and the lively seaside resorts La Ciotat, Bandol and Saint Cyr, as well as the famous Calanques (fjords) of Cassis. The terrace has an area of 60 square meters and is equipped with an electric barbecue, pergola, table, 6 chairs, 2 reclining chairs, settee and 4 armchairs. The site has an area of 13 000 m² with Mediterranean vegetation and from here you have a view of the sea. The communal swimming pool is fenced and has a dimension of 12 x 6 m, depth 1 to 2.20 m and is equipped with convenient stairs and features an outdoor shower, 6 deck chairs, 6 reclining chairs and 2 umbrellas. Cottage 60m² / Sleeps 4-7. 2 Bedrooms - 1 Bathroom. Shared fenced pool. Covered heated SPA. Sea 3 km - Sea view. Style : Cottage on one level. Large grounds and pretty sea views. 3 km from the picturesque Provencal village of Ceyreste, 8 km from La Ciotat. 35 km south east of Marseille. Living/Dining room : 30m², double sofa bed, TV, dining table, 5 chairs. Open kitchen : fridge-freezer, small oven, electric hob, dishwasher, coffee maker. 2 Bedrooms, 1 Shower room, 1 wc: Bedroom 1 : ground floor, 11m², double bed, wardrobe. Bedroom 2 : ground floor, 9m², single bed, narrow single bed (80cm) which may be turned into a queen size bed (160cm), chest of drawers. Shower room : ground floor, separate, shower, 2 basins, washing machine, wc. Household information : Phone: no Internet: wifi available when near the owner''s home Cot TV Small pets welcome Noise: none Parking on site for 2 cars Owner's home is approx 100m Overlooked: no 2 dogs on site. Situated 3 km from the picturesque Provencal village of Ceyreste, 3 km from the sea and 8 km from LA CIOTAT. La Ciotat is a charming seaside resort on the Côte d''Azur, between beaches and rocky inlets, in a bay, backed by the Bec de l'Aigle and Cape Canaille, facing the sea. La Ciotat benefits from an exceptional natural surrounding: the highest cliffs in Europe, beautiful long sandy beaches, the rocky inlets of Mugel and Figuerolles, Ile Ver, to mention a few. Environment : Country setting. Sea: 3 km Supermarket: 3 km Shops: 2 km Doctor: 3 km Town centre: 3 km. PLACES TO SEE: La Ciotat. 8 km. Delightful seaside resort with excellent beach, fabulous rocky inlets, old picturesque fishing port and great Mediterranean atmosphere. Cassis. 15 km. Chic seaside resort at the foot of the tall Cap Canaille cliff, with picturesque fishing port lined with attractive traditional pastel painted buildings and plenty of cafes and restaurants. Aubagne. 20 km. Pleasant town surrounded by hills and rocky crags, with nicely renovated old quarters. Birthplace of Marcel Pagnol of Jean de Florette fame. Bandol. 20 km. Family seaside resort tucked in a cove between La Ciotat and Toulon. A vibrant harbour packed with fine shops and restaurants as well as a casino. Also renowned for its vineyards producing some of the best wines on the coast. THINGS TO DO: Expenature, La Ciotat. 5 km. Tree top adventure park, Sea Kayaking, Climbing, Orienteering, Mountain Biking and plenty more! Make your own adventure! Half a day and full day sessions available as well as 2+ day courses. Ok Corral, Cuges les Pins. 15 km. Theme park. Far Western village in a pine forest with over 40 attractions. Thrills and fun guaranteed. Karting Indoor Provence and Laser Games Megazone, Aubagne. 20 km. Multi leisure centre with karting (for both children aged 7+, and adults), mini-motos (adults only), laser games, games room (video games, table football, air hockey, etc.). Great indoor fun, whatever the weather. Golf Country Club de la Salette, Marseille. 25 km. Golf course. 18 holes/9 holes Par 71/27 - 5824m/680m. A unique and privileged location in the sunny hills described by the famous French writer Pagnol. FURTHER AFIELD: Sanary sur Mer. 30 km. Delighftul seaside resort with picturesque quay, colourful houses, lively streets and terraces shaded by palm trees. Beautiful views from its 16th century Chapel Notre Dame de Pitié, over the coast and the small islands that lie offshore. Marseille. 35 km. Second largest city in France, cosmopolitan and exuberant, renowned for its picturesque old port and Bouillabaisse (a tomato based soup with a multitude of different fish and shellfish). Aix en Provence. 50 km. Stunningly beautiful and vibrant city, distinctively Provencal, with sunny squares filled with cafes, broad avenues lined with gigantic plane trees and tempting restaurants, and a substantial historical centre with elegant shops and attractive houses. Hyères. 60 km. Attractive seaside resort with walled and medieval centre, once the favourite summer resort of celebrities, some of the intellectual elite and the rich. The town and its peninsula have almost 40 km of pristine sand beaches and rocky inlets to offer. HOW TO GET THERE: Low cost flights from UK to Marseille (1 hr), Avignon (90mn). To be paid on site : Security deposit: 400€ cash and additional 200€ if pets Bed linen and towels provided. Option booking not available Please note: the rates do not include the mandatory hirers' liability insurance. This small amount is a percentage of the rental sum starting from 10 Euros per reservation. Terre du Baguier - Mia. This holiday home is located in a private domain with 3 other houses, it is very quiet and rural. It is close to the sea and the lively seaside resorts La Ciotat, Bandol and Saint Cyr, as well as the famous Calanques (fjords) of Cassis. The terrace has an area of 60 square meters and is equipped with an electric barbecue, pergola, table, 6 chairs, 2 reclining chairs, settee and 4 armchairs. The site has an area of 13 000 m² with Mediterranean vegetation and from here you have a view of the sea. The communal swimming pool is fenced and has a dimension of 12 x 6 m, depth 1 to 2.20 m and is equipped with convenient stairs and features an outdoor shower, 6 deck chairs, 6 reclining chairs and 2 umbrellas. Living/Dining room : 15m², double sofa bed, TV, dining table, chairs, fridge-freezer. Kitchen : 4m², small oven, electric hob, dishwasher, washing machine, coffee maker. 2 Bedrooms, 1 Bathroom, 1 wc: Bedroom 1 : ground floor, 9m², twin beds, armchair. Bedroom 2 : ground floor, 20m², double bed, wardrobe, armchair. Bathroom : ground floor, separate, bath, basin, wc. Household information : Phone: no Internet: wifi Cot TV Small pets welcome Noise: none Parking on site for 2 cars Owners home is approx 10m from ref 32911 Overlooked: on the terrace 2 dogs on site. Situated 3 km from the picturesque Provencal village of Ceyreste, 3 km from the sea and 8 km from LA CIOTAT. La Ciotat is a charming seaside resort on the Côte d''Azur, between beaches and rocky inlets, in a bay, backed by the Bec de l''Aigle and Cape Canaille, facing the sea. La Ciotat benefits from an exceptional natural surrounding: the highest cliffs in Europe, beautiful long sandy beaches, the rocky inlets of Mugel and Figuerolles, Ile Ver, to mention a few. Environment : Country setting. PLACES TO SEE: La Ciotat. 8 km. Delightful seaside resort with excellent beach, fabulous rocky inlets, old picturesque fishing port and great Mediterranean atmosphere. Cassis. 15 km. Chic seaside resort at the foot of the tall Cap Canaille cliff, with picturesque fishing port lined with attractive traditional pastel painted buildings and plenty of cafes and restaurants. Aubagne. 20 km. Pleasant town surrounded by hills and rocky crags, with nicely renovated old quarters. Birthplace of Marcel Pagnol of Jean de Florette fame. Bandol. 20 km. Family seaside resort tucked in a cove between La Ciotat and Toulon. A vibrant harbour packed with fine shops and restaurants as well as a casino. Also renowned for its vineyards producing some of the best wines on the coast. THINGS TO DO: Expenature, La Ciotat. 5 km. Tree top adventure park, Sea Kayaking, Climbing, Orienteering, Mountain Biking and plenty more! Make your own adventure! Half a day and full day sessions available as well as 2+ day courses. Ok Corral, Cuges les Pins. 15 km. Theme park. Far Western village in a pine forest with over 40 attractions. Thrills and fun guaranteed. Karting Indoor Provence and Laser Games Megazone, Aubagne. 20 km. Multi leisure centre with karting (for both children aged 7+, and adults), mini-motos (adults only), laser games, games room (video games, table football, air hockey, etc.). Great indoor fun, whatever the weather. Golf Country Club de la Salette, Marseille. 25 km. Golf course. 18 holes/9 holes Par 71/27 - 5824m/680m. A unique and privileged location in the sunny hills described by the famous French writer Pagnol. FURTHER AFIELD: Sanary sur Mer. 30 km. Delighftul seaside resort with picturesque quay, colourful houses, lively streets and terraces shaded by palm trees. Beautiful views from its 16th century Chapel Notre Dame de Pitié, over the coast and the small islands that lie offshore. Marseille. 35 km. Second largest city in France, cosmopolitan and exuberant, renowned for its picturesque old port and Bouillabaisse (a tomato based soup with a multitude of different fish and shellfish). Aix en Provence. 50 km. Stunningly beautiful and vibrant city, distinctively Provencal, with sunny squares filled with cafes, broad avenues lined with gigantic plane trees and tempting restaurants, and a substantial historical centre with elegant shops and attractive houses. Hyères. 60 km. Attractive seaside resort with walled and medieval centre, once the favourite summer resort of celebrities, some of the intellectual elite and the rich. The town and its peninsula have almost 40 km of pristine sand beaches and rocky inlets to offer. HOW TO GET THERE: Low cost flights from UK to Marseille (1 hr), Avignon (90mn). Sea: 3 km Supermarket: 3 km Shops: 2 km Doctor: 3 km Town centre: 3 km. Please note: no discounts other than those featured on this page are available for this property. Household information : Phone: no Internet: wifi Cot TV Small pets welcome Noise: none Parking on site for 2 cars Owners home is approx 10m from ref 32911 Overlooked: on the terrace 2 dogs on site. To be paid on site : Security deposit: 400€ cash and additional 200€ if pets Bed linen and towels provided. Cottage 55m² / Sleeps 4-6. 2 Bedrooms - 1 Bathroom. Wifi internet. Shared fenced pool. Sea 3 km - Sea view. Style : Cottage on one level. Large grounds and pretty sea views. 3 km from the picturesque Provencal village of Ceyreste, 8 km from La Ciotat. 35 km south east of Marseille. Option booking not available Please note: the rates do not include the mandatory hirers' liability insurance. This small amount is a percentage of the rental sum starting from 10 Euros per reservation. Terre du Baguier - Mambo. This holiday home is located in a private domain with 3 other houses, it is very quiet and rural. It is close to the sea and the lively seaside resorts La Ciotat, Bandol and Saint Cyr, as well as the famous Calanques (fjords) of Cassis. The terrace has an area of 60 square meters and is equipped with an electric barbecue, pergola, table, 6 chairs, 2 reclining chairs, settee and 4 armchairs. The site has an area of 13 000 m² with Mediterranean vegetation and from here you have a view of the sea. The communal swimming pool is fenced and has a dimension of 12 x 6 m, depth 1 to 2.20 m and is equipped with convenient stairs and features an outdoor shower, 6 deck chairs, 6 reclining chairs and 2 umbrellas. Living/Dining room/Kitchen: 3-seater sofa, TV, dishwasher, washing machine, oven, induction hob, fridge, small freezer, breakfast bar and seats. 1 Bedroom, 1 Mezzanine, 1 Shower room, 1 Separate wc: Bedroom: queen size bed (160cm), cupboard, armchair. Mezzanine: overlooking the living room, double bed, cupboard. Shower room: separate, shower, basin. Separate wc. Household information : Phone: no Internet: wifi available when near the owner''s home Cot TV Small pets welcome Noise: none Parking on site for 2 cars Owners home is approx 100m away Overlooked: no 2 dogs on site. Situated 3 km from the picturesque Provencal village of Ceyreste, 3 km from the sea and 8 km from LA CIOTAT. La Ciotat is a charming seaside resort on the Côte d''Azur, between beaches and rocky inlets, in a bay, backed by the Bec de l''Aigle and Cape Canaille, facing the sea. La Ciotat benefits from an exceptional natural surrounding: the highest cliffs in Europe, beautiful long sandy beaches, the rocky inlets of Mugel and Figuerolles, Ile Ver, to mention a few. Environment : Country setting. See also ref 32911 and ref 3291. PLACES TO SEE: La Ciotat. 8 km. Delightful seaside resort with excellent beach, fabulous rocky inlets, old picturesque fishing port and great Mediterranean atmosphere. Cassis. 15 km. Chic seaside resort at the foot of the tall Cap Canaille cliff, with picturesque fishing port lined with attractive traditional pastel painted buildings and plenty of cafes and restaurants. Aubagne. 20 km. Pleasant town surrounded by hills and rocky crags, with nicely renovated old quarters. Birthplace of Marcel Pagnol of Jean de Florette fame. Bandol. 20 km. Family seaside resort tucked in a cove between La Ciotat and Toulon. A vibrant harbour packed with fine shops and restaurants as well as a casino. Also renowned for its vineyards producing some of the best wines on the coast. THINGS TO DO: Expenature, La Ciotat. 5 km. Tree top adventure park, Sea Kayaking, Climbing, Orienteering, Mountain Biking and plenty more! Make your own adventure! Half a day and full day sessions available as well as 2+ day courses. Ok Corral, Cuges les Pins. 15 km. Theme park. Far Western village in a pine forest with over 40 attractions. Thrills and fun guaranteed. Karting Indoor Provence and Laser Games Megazone, Aubagne. 20 km. Multi leisure centre with karting (for both children aged 7+, and adults), mini-motos (adults only), laser games, games room (video games, table football, air hockey, etc.). Great indoor fun, whatever the weather. Golf Country Club de la Salette, Marseille. 25 km. Golf course. 18 holes/9 holes Par 71/27 - 5824m/680m. A unique and privileged location in the sunny hills described by the famous French writer Pagnol. FURTHER AFIELD: Sanary sur Mer. 30 km. Delighftul seaside resort with picturesque quay, colourful houses, lively streets and terraces shaded by palm trees. Beautiful views from its 16th century Chapel Notre Dame de Pitié, over the coast and the small islands that lie offshore. Marseille. 35 km. Second largest city in France, cosmopolitan and exuberant, renowned for its picturesque old port and Bouillabaisse (a tomato based soup with a multitude of different fish and shellfish). Aix en Provence. 50 km. Stunningly beautiful and vibrant city, distinctively Provencal, with sunny squares filled with cafes, broad avenues lined with gigantic plane trees and tempting restaurants, and a substantial historical centre with elegant shops and attractive houses. Hyères. 60 km. Attractive seaside resort with walled and medieval centre, once the favourite summer resort of celebrities, some of the intellectual elite and the rich. The town and its peninsula have almost 40 km of pristine sand beaches and rocky inlets to offer. HOW TO GET THERE: Low cost flights from UK to Marseille (1 hr), Avignon (90mn). Sea: 3 km Supermarket: 3 km Shops: 2 km Doctor: 3 km Town centre: 3 km. Please note: no discounts other than those featured on this page are available for this property. Household information : Phone: no Internet: wifi available when near the owner''s home Cot TV Small pets welcome Noise: none Parking on site for 2 cars Owners home is approx 100m away Overlooked: no 2 dogs on site. To be paid on site : Security deposit: 400€ cash and additional 200€ if pets Bed linen and towels provided. Cottage 50m² / Sleeps 4. 1/2 Bedrooms - 1 Bathroom. Shared fenced pool. Sea 3 km - Sea view. Style : Well equipped cottage. Pretty sea views. Large grounds. 3 km from the picturesque Provencal village of Ceyreste, 8 km from La Ciotat. 35 km south east of Marseille. Option booking not available Please note: the rates do not include the mandatory hirers' liability insurance. This small amount is a percentage of the rental sum starting from 10 Euros per reservation. Résidence Shangri-La is a small holiday park in a quiet, green area. It consists of 65 well-kept wooden chalets that are nicely arranged under the shady pine trees. They are all neatly and practically furnished and have air conditioning, a kitchenette and a wooden terrace with outdoor furniture. We offer the choice of a three-room chalet for 5 to 6 people (FR-13470-03) or a chalet with four rooms for 7 to 8 people (FR-13470-04). This spacious and nicely furnished holiday home is located on a secured domain, a kind of Provençal village consisting of semi-detached holiday homes. This semi-detached holiday home features a private garden (300 m2) and in front of the house you'll find a covered terrace with garden furniture. The house consists of a modern living room with a double sofa bed, a bathroom with shower and washing machine and a fully equipped open plan kitchen. On the first floor, you'll find 2 bedrooms and 1 bathroom with bathtub, washbasin and toilet. One bedroom features a double bed and the second bedroom has a bunk bed. The house is equipped with air conditioning. The domain is closed with a large automatic gate. You'll receive your own access code. There are lots of things to do in the holiday park. At the entrance of the holiday park you'll find a hotel, bar, restaurant and sport fields. For a fee you can also use the tennis courts and the 6-hole golf course. During the vacation period, pony and horseback riding is also possible. The large, protected swimming pool is about 40 m away from the holiday home. There are wonderful loungers near the swimming pool. Want to explore the surroundings? There is plenty to do. The historical artists' town of Arles is less than 4 km away. This nice city offers many antique buildings and art and is certainly worth a visit. You can also enjoy outdoor cafes and wonderful restaurants. Les Baux de Provence, Château d’Estoublon, Fontvieille , Avignon (with its yearly festival) and Nîmes are less than 30 km away. The Mediterranean with its beautiful seaside resorts ‘Saintes-Marie-de-la-Mer’ and ‘Grau du Roi’ are less than half an hour by car away and a little further you'll find the beautiful old city ‘Aigues Mortes’ with its old city walls. In short: a holiday where you can experience sports, relaxation, culture and nature. Studio-terrace close to the port of La Ciotat. Welcome to our studio for lunch, with its private terrace, located in a quiet area of ​​the center of La Ciotat, close to the old port. Mod cons small house very close to the Calanques of Figuerolles et Mugel. 1 km from a village, a house (130 m2) with a superb swimming pool and only 30 km from the beaches. Aix-en-Provence, its old quarter and above all its flower markets on Tuesdays, Thursdays and Saturdays should not be missed. To do: a trip to St. Victoire Mountain (more than just a mountain, its the symbol of Provence) via Picassos tomb at Vauvenargues chateau. Depending on the direction of the wind there is some traffic noise, especially in the morning and in the late afternoon. A studio apartment adjoining the house is rented all year (the occupant is absent during the day). An extremely comfortable house with a summer kitchen (pizza oven), perfect for a multi-family holiday. The apart'hotel is ideally located in the heart of the city center, close to the "Vieux Port" and the characteristic Avenue de Canebière and 100 meters from the metro and the tram. 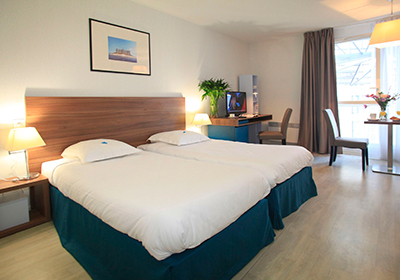 The Odalys Apart'hotel Marseille Canebiere is ideally situated in the heart of Marseille close to the famous Old Port and just 100m from metro and tramway stations on the recently renovated Canabiere. With the Hotel Formula (short stay - 1 to 4 nights) you have the choice of double or twn bedrooms or a junior suite for 2/4 people. With the Residential Formulas (medium stay 5-28 nights & long stay over 29 nights), you have the choice of 1 bedroom apartments for 4 people with sofa bed in the living room and either twin beds or double bed in the bedroom. All holiday rentals are fully equipped with kitchenette (fridge, electric hob, microwave), shower room with toilet, free television and Internet connection. At your disposal : Sports room, laundry facilities (extra charge), bike storage, Gambetta public car park 50m away Marseille, a city of art and culture, a place of many miracles. With an existence dating back to 26 centuries, it is a perfect combination of tradition and modernity. The city remains deeply marked by its past and constantly reveals traces of all the cities that succeeded each other over the centuries. It leads the visitor of his Greek and Roman origins to the modernity of the present century, with its great architectural achievements of the 21st century, through the medieval religious foundations, the fortifications of the 16th century, the rich residences of the 17th century and 18th century and the many prestigious buildings from the 19th century. - Metro, tram, bus - Numerous restaurants - Beaches - Boat rental - ice rink, swimming pools - concert halls, theater, cinemas, discotheques - Aqualand in Saint Cyr sur mer (30 minutes drive) Discovery of the different neighborhoods of the city and the monuments The Notre Dame de la Garde basilica, the old part of the city, the main street of la Canebière, the old port, the abbey Saint-Victor, the town hall, the vieille Charité, building from the 17th century, the block of flats "the radiant city" Le Corbusier, the Estaque area and the painters, Rive Neuve, the Pharo palace, Palais de la Bourse, Les Docks de Marseille, the Frioul islands and the "château d'If" and les îles du Marseille-Provence 2013, Marseille the capital of European culture: New cultural centers, such as the "Mémorial de la Marseillaise" and the center of cinematography of the Mediterranean in the castle of La Buzine. The city of popular art, dedicated to creation and cultural expression, a unique site in Europe, the dance center, located in the residence of the dancer Michel Kelemenis or the museum of European and Mediterranean civilizations (MuCEM). The MuCEM, which follows in the footsteps of the National Museum of Popular Arts and Paris traditions, extends over a vast area of ​​40,000 m², from the renovated Fort Saint-Jean to the J4, through the Center for Conservation and Knowledge. housed in the Belle de Mai district. Cassis, Aubagne, Aix en Provence and the "blue coast" (Carry le Rouet) just 30 minutes. Tourism and Convention Bureau of Marseille - 11, la Canebière - 13001 Marseille Tel: ... marseille-tourisme.com Conditions: Prices in euros, per accommodation and per night Deposit to pay on the spot: 300 € (average stay - 5 to 28 nights) - 500 € (29 nights and more) Tourist tax to pay on the spot: 0.83 € / day / person Animal - * With the current vaccination booklet and tattoo. Dogs must be kept on a leash in the apartment. At your disposal: breakfast service, fitness room, bicycle storage, laundry with coins, luggage storage and 7 days a week reception. Public parking Gambetta at 50 m. Please note that any additional services that are payable locally may be changed without prior notice. All information provided is intended to be informative and general. We are not liable if such changes occur unexpectedly. Option booking not available Please note: the rates do not include the mandatory hirers' liability insurance. This small amount is a percentage of the rental sum starting from 10 Euros per reservation. Domaine Golf de la Cabre d'Or is a medium-sized holiday park in a quiet, green environment. It consists of dozens of connected houses and apartments. They are all well furnished and equipped with a complete kitchenette and a balcony or terrace / garden with outdoor furniture. We offer the following types: - 2-room apartment for 4 people (FR-13480-02); - 2-room apartment for 4 persons with garden, ground floor (FR-13480-03); - 2-room apartment for 4 persons with balcony (FR-13480-04); - 3-room apartment for 6 people (FR-13480-05); - Maisonette with 3 rooms for 6 persons (FR-13480-06); - Maisonette with 4 rooms for 8 persons (FR-13480-07). This house is situated 1km from the village of Plan dOrgon. All services within a 5km radius. Its geographical location is ideal for exploring two of the most beautiful regions in Provence: on one side the Alpilles (St Remy and Les Baux de Provence), on the other side the Luberon. Family accommodation with a pretty swimming pool. Tastefully decorated detached Mas, within walking distance of the cafes and restaurants of the village of Eygalières. This Mas has been recently renovated with old traditional materials and is decorated with warm, tasteful Provençal decoration. The fully equipped kitchen adjoins a spacious dining room and living room with patio doors to the large terrace and your own swimming pool (heatable). On the ground floor, there are 2 spacious bedrooms, both with their own luxury bathroom. On the second floor, you will find two more comfortable bedrooms, each with its own luxury bathroom. Outside, an indoor pool house with sheltered seating area and barbeque invites guests for an aperitif and dinner. There is also a covered terrace that receives morning sun for breakfast. The pool is secured with an electrically operated hatch and offers safety for people travelling with children. Next to the pool is a sun terrace with luxurious sunbeds. The enclosed garden is very well maintained, and there is plenty of room to play. With privacy in the house and garden and within walking distance to the beautiful village of Eygalieres, this is an ideal location for family holidays or trips with friends to discover the wonders of the Alpilles. The area is impressively beautiful with hills full of vineyards, lavender fields and countless fruit trees and small villages in the area to major cities such as Avignon and Aix-en-Provence. A trip to the famous Saint Rémy de Provence (10 km away) is definitely worth it. It is located in the heart of Provence and offers small streets with a variety of cafés and restaurants, squares with fountains, shops and galleries. There's a weekly market on Wednesdays. Welcome to pure Provence! At the foot of the Alpilles between Arles and Saint-Remy-de-Provence, you can find this beautiful villa with modern furnishings and a private swimming pool. The villa is surrounded by the lovely French parasol trees! You can watch squirrels jump from tree to tree from the spacious terrace. A perfect spot for a holiday in the wonderful surroundings of Saint-Remy-de-Provence. Plenty of picturesque villages and beautiful nature! It's not hard to see why Vincent van Gogh created his most beautiful paintings in this spot. Saint-Remy-de-Provence is the birthplace of the philosopher Nostradamus and was once the home of Vincent van Gogh. You can also visit the village of Les Baux de Provence and the caves from where the light shows project the most beautiful paintings on cliffs. Try the genuine atmosphere of the southern French cities such as Arles, Avignon and Nîmes. Stop on the way to have lunch in Bistro du Paradou, singer Charles Aznavour's local restaurant. Most of all, sit back and relax! The village of Saint-Etienne-de-Grés features a small supermarket and a baker. Hikers depart from the nature reserve of Mas du Pommet to explore the beautiful Alpilles. Enjoy the 'Domaine de Manville' 18-hole golf course in Les-Baux-Provence and engage in some fine dining at the Château de l'Estoublon (on the way to Fontvieille). This recently built villa with modern furnishings and a wonderful, large private swimming pool is located in the heart of the Provence, between Saint-Remy-de-Provence and Avignon. A perfect place for a holiday in the marvellous surroundings of the pleasant village of Saint-Remy-de-Provence. Plenty of picturesque villages and beautiful nature! It's not without a reason that Vincent van Gogh made his most beautiful paintings here. Visit the village of Les Baux de Provence and the caves where they project beautiful paintings on the rock walls. Try the genuine atmosphere of the southern French cities such as Arles, Avignon and Nîmes. Stop on the way to have lunch in Bistro du Paradou, singer Charles Aznavour's local restaurant. Go hiking or rent a mountain bike to explore the Alpilles nature reserve. In the village of Eyragues you can get the most delicious regional delicacies on Friday, while the children play around the fountain. After the market you can get a nice plat-de-jour (daily menu) on the terrace and go on another trip in the afternoon. After all, there's more than enough to do and see here! This bright villa is located within walking distance of the river Rhône and the lovely village of Tarascon. Wander down to the village for a cup of coffee at one of the outdoor cafés, or to get your fresh croissants in the morning. Don't miss the opportunity to visit the colourful market on Tuesday mornings. It's the best place to buy some beautiful, regional ingredients for your evening meal. You'll find everything you may need within a 20-km radius. From golf course to horse riding school, from fine wines to the arena in Arles - all within easy reach. On foot, by bicycle or by car - whatever suits you best. Your villa is located in a cul-de-sac in a residential area and features a long back garden. The gate at the end of the garden takes you through to the swimming pool with sun terrace. There's a covered area adjacent to the pool, which can be closed off altogether. Underneath it you'll find a wonderful whirlpool. A little further on, you'll find the gym, which is equipped with a range of fitness machines. There's another covered terrace with a barbecue right outside the house. Indoors, you'll find a nice lounge and a dining table which also serves as a billiards table! The open kitchen is perfect for cooking delicious, Provençal meals. There are two downstairs bedrooms: one with two single beds and one with a double bed and patio doors opening out into the garden. There are two more bedrooms and a bathroom upstairs. All bedrooms are fitted with a flat-screen TV.